Opening the mini-album with the electronic synth prominent title track, Matt emotionally recounts the moments leading up to the pivotal moment in his life, making him who he is today (presumably Matt becoming a Christian, or him deciding to pursue music full time- the ‘moment’ is vague in order to appeal to a wide variety of audiences, I reckon!). Reminding us that every dream in our hearts is put there by God, and He is nudging us in the direction He wants us to move into to fulfil the plans God has for us, a deeper look at the song may stir up some controversy in the topic of ‘predestination v free will’…but Matt nevertheless provides us with issues to ponder as we think about the dreams we have in our lives and realise that God wants to see them to fruition as well! The poppy CCM guitar led melody “Every Moment” is next, and boldly speaks about how we should live every moment on this earth to the full and glorifying Jesus. With Matt explosively and eloquently reiterating that ‘…I don’t want the sun to come down, without taking it all in, I don’t want the fire to burn out, I don’t want to waste one minute, so take my heartbeat, synchronise me to live every, live every, live every moment…’, we are glimpsed into a vulnerable heart aching for a reason to live, a reason that makes every moment worthwhile. Fortunately, Jesus is that moment, and Matt alludes to this quite cleverly. With the midpoint of the EP “Beautiful Now” inspired by Matt marrying his wife 5 years ago, we are encouraged to believe the eternal truth that everyone is beautiful inside and out in God’s eyes, all the time, regardless of the opinions of everyone and anyone else, and is definitely one of the highlights of this brief but impacting EP. “Beautiful Now”, a potential radio single in the future, has also been featured on KLTY’s program New Music Café in recent times, and with a stripped down and intimate acoustic version included at the end of the EP, definitely reminds me that Matt’s future is bright, and that everyone needs to listen to his music very soon! As Matt and his wife moved from the comfort of Atlanta to the unfamiliarity and unknown of Nashville to pursue music, the guitar led mid-tempo “Falling Into You” was born out of that tension and wrestle, as he asked questions of God many times, concluding that ‘…time and time again You’ve proved with every season I’ve walked through, Your plans are always are good for me, You’re faithful in where You lead…’, with Matt ardently declaring that he will follow God wherever He leads, amongst the backdrop of captivating and inspiring keys and strings. The final song on the EP is the first single “Fortress”, an ethereal, haunting and captivating keys and electronic led melody where Matt reasserts that Jesus is his shelter, rock, refuge and fortress, the One he can turn to in any situation. A challenge for us to remember to call on Jesus as a first resource, instead of a last resort, Matt has beautifully crafted a challenging and enjoyable EP that has me yearning for more! 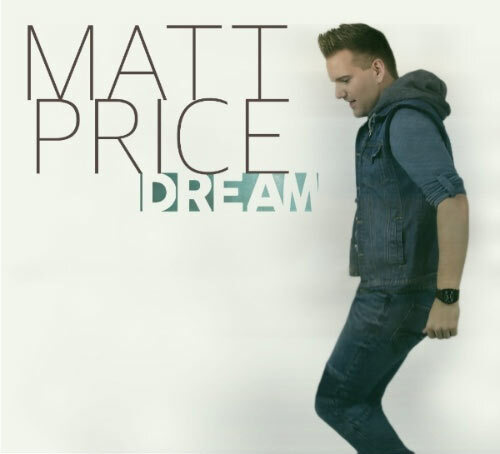 Providing us with thoughtful topics to dwell upon, Matt Price has delivered a worthy follow-up to We Won’t Waver and Dream is an album worthy of multiple listens. Despite releasing in the same week as albums from Jody McBrayer, Audrey Assad and Lacey Sturm, Matt’s honesty and vulnerability is sure to generate buzz and draw in even the most uninterested of listeners. So…the long and short of it is listen to this EP! You won’t be disappointed, and you will be encouraged by the fact that you are never too young or old to chase your dreams, and with God’s help, nothing is impossible!